This is the mother's day card I made for my Mom this year. I had made the butterfly a couple of weeks ago because I wanted to try the hatpins for the pretties kit. When the butterfly was done. 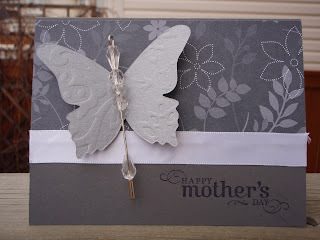 I wasn't sure what I was going to do with it and then all of a sudden, yesterday, it popped into my head that I would use it to make my Mom a card.. the butterfly was embossed using the bigshot texture templates. 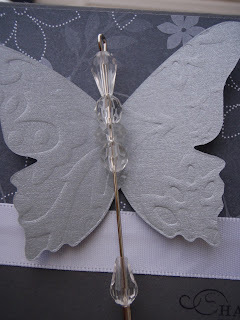 Then I used my butterfly die cut .Silver paper was used. With the hatpin, I used crystal effects and glued it directly to the butterfly. The base of the card is basic grey and the pattern paper is Walk in the Park. White satin ribbon was used to finish off the look. Now Mom, if you see this first, act surprised when you get the card in the mail. I love your blog! you have such cute ideas. I don't think I have ever seen the butterflies textured, I will definitely have to try this sometime! What a great mothers day card. An awesome card....wish I had been that creative! I bet your Mom loved it.